Grey water is dirty water from your bath, shower, dishwasher, washing machine, kitchen sink and it can be utilised to water your gardens. Using grey water is a bit more complicated than just pumping it straight onto your lawns as the phosphates in the soaps and detergents in the water will eventually poison your soil and kill your plants. What do you have to do to be able to use grey water? Firstly, grey water has to be sorted so that water containing harsh chemicals and abrasives does not end up on your garden but goes down the sewer as it should. Only water from baths, showers, handbasins and washing machines can be used on your garden, water from all other sources must be sent down the sewer. Water from your kitchen sink and dishwasher contain harsh detergents of an abrasive nature which should go into the sewer and not your garden. Water from your washing machine can be utilised but you will need to make a couple of changes to the way you do your washing. Certain detergents and washing aids such as fabric softeners and sodium hypochlorite (JIK) can no longer be used as they are as abrasive as the detergents you use for your dishes. Washing powders should be phosphate free as phosphates will eventually build up in your soil and kill your plants. The next step is to collect the grey water by piping the water from the outlets of the house to a central tank where the water is run through a basket filter which collects all the bits of fluff etc before the water runs into the tank. 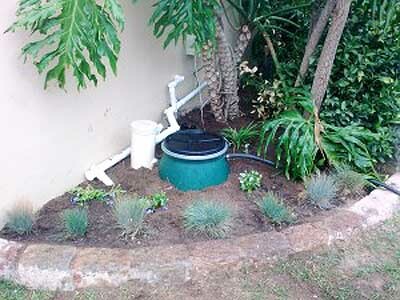 Once there is about 40 litres of water in the tank it should be pumped out into the garden. Of course the whole system should be automated and your pump should switch on when the water level in the grey water bin reaches a pre set level. When the tank is empty the pump should again switch off automatically. One of the rules of using grey water is that it should NEVER be stored. Most grey water is warm when it leaves the home and has a food value for anaerobic bacteria which breed and produce methane and hydrogen sulphide. You have all smelled “stink bombs” and you don't want you garden smelling like that. To use the grey water you need a low pressure pump that is strong enough to supply two sprinklers at a time and give a spray of about six meters in diameter each. A high pressure pump will cause the sprinklers to form a mist which will result in the bacteria in the water being spread about by the wind instead of landing on the ground in water particles and being absorbed. Grey water should not be run onto the ground and left to dam up in a hollow as the bacteria in the water will soon clog up your soil. Grey water is dirty water and must not be fed into any high pressure irrigation system that forms a mist when delivering the water to the garden. Grey water clogs up micro jets and will eventually be the demise of your sprinkler system. The rule is to only use clean water for irrigation systems. Before setting up your own grey water system it is advisable to do your own research to find out what will work best for your situation, There are many ways to save water and reduce your water bills. This is just one of them!